It is our main priority to always provide our customers with convenience and reliable assistance. That is why we offer an all-round house clearance in London. Our coverage of the English capital is impressive since we have teams in every single district of the city and we are ready to adequately respond to your unique home clearance requirements. You will appreciate our house clearance solutions if you are renting out or selling or simply owning a home. We offer one of the most outstanding service qualities in London. With a remarkable experience under our belt, we have successfully established ourselves as a trustworthy and reputable company on the capital’s market of house clearances. We work with trained professionals who can organise full-scale home clearance projects. Regardless of how big your property is or where it is set, our skilled staff can collect all types of unwanted possessions and furniture in an effective and speedy manner. What is more, they will transport the rubbish to a designated disposal site. Recyclable items, on the other hand, will be sent to a recycling facility so that they can be reused. Carrying out house clearances is a very responsible job as it deals with the handling of customers’ personal possessions. 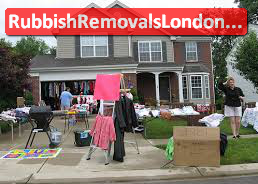 We are a rubbish removal company in London that would never take advantage of our clients’ trust. Instead, all we aim to make the entire process smooth and stress-free for you. That is why our team is very well-mannered and trustworthy. Our personnel do their job thoroughly, yet quietly. For us, safety always comes first. Therefore, we carefully follow the industry’s rules and regulations. We can guarantee that during your house clearance, we will not break or scratch any parts of your property. To prevent having any valuables, jewellery or important documentation thrown away, we make sure to double-check with the client if they truly want the items cleared out from their house. We have a very dynamic schedule and our team is properly organised and managed. As a result, hiring us is fairly easy. We are even prepared to respond to same-day and last-minute bookings. For the convenience of our customers, we can also collect waste after regular business hours whenever that is necessary. To hire us, you can send us a quick email, pay us a visit at the office or simply give us a call. Our lines are always open, allowing you to reach us at a time that suits you best. We guarantee that we will effectively collect and dispose of the waste and junk in your house. We have a good coverage of London. The capital of the UK has many iconic attractions but the Buckingham Palace is certainly among the most famous of them. Set in the inner London borough of the City of Westminster, today the building is known as the home of Queen Elizabeth II. However, the present head of the UK is not the only British ruler to have lived in the legendary structure. Back in the 19th century, Queen Victoria was the first monarch who used the Buckingham Palace as an official residence.